I am finishing Friendship Chain. It is so very very close now. The last of the chains are done and all sewn together into the last of the rows. The last row is now in the process of being stitched in place. My friend Charlene and I are doing a trunk show about English Paper Piecing on Thursday evening for our guild. I so very much want to have this done by then so I’m putting on a push to get the last 2 very long seams done by then. I have plans to spend the rest of the afternoon working on that while watching Inspector Morse mysteries. Great quote from your friend. I'm sure you'll get this finished before Thursday, along with the other blocks. This looks amazing! I can’t wait to see it in person on Thursday! And the chain just like our friends...hold us together and keep us from falling apart! This quilt looks more beautiful every time I see it - and Susan's comment is perfect! 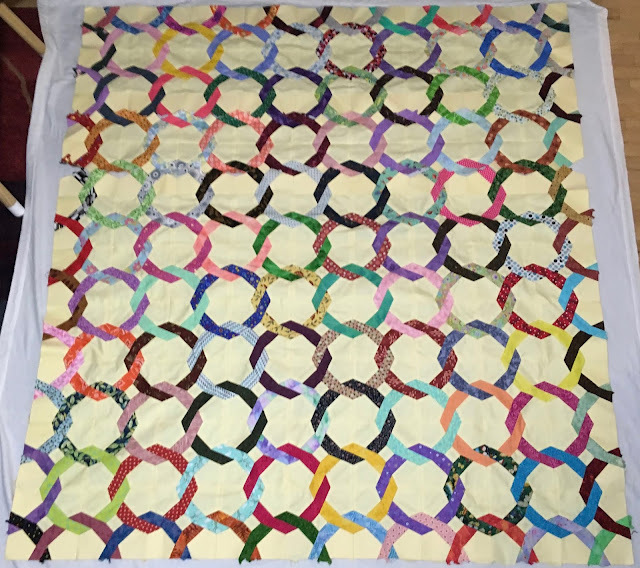 This quilt is gorgeous and thank you for using my comment in your pattern description. You will get it done on time....You can see the finish line! I like Deanna's comment as well. I know that you have often held me together and kept me from falling apart over the last 30+ years. I am so proud of my quilter sister.